UNIVERSITY PARK — Michal Menet seemingly had everything working against him coming into the season. He was asked to switch positions with Connor McGovern from right guard to center, and when put in game situations he saw a lot of atypical defensive packages from both Appalachian State and Pitt. Mix that with wet weather conditions in Pittsburgh last weekend and it’s easy for someone to forgive him if the mistakes were to come with the obstacles. However, nobody has had to do that so far because he and the offense have the transition look rather fluid. Now he, like the rest of his team, is on to Kent State — which Menet says has a lot of similarities on defense to that of the Mountaineers in week one — in weather conditions much like the Lions played in last weekend. Menet is quick to say he’s grown a lot on the field in just the first two games of the season, but also is the first to point out that there is still work to be done. The offensive line has surprised early on, allowing the Lions to have a balanced attack with an average of 204 passing yards to go with an average of 208 yards rushing in their first two games. 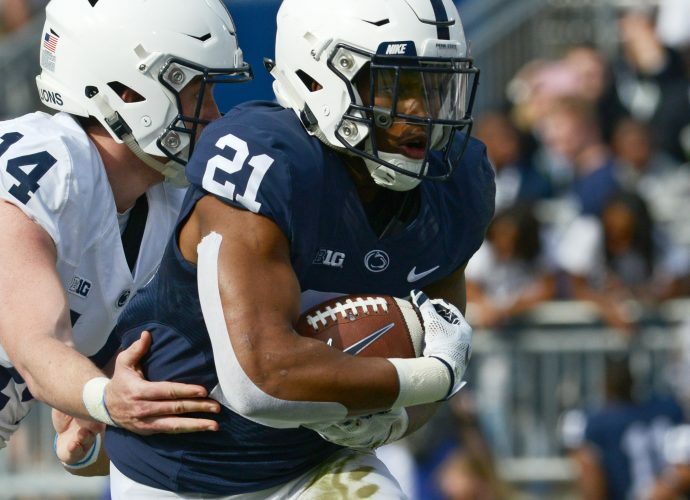 Keeping quarterback Trace McSorley upright is the important task for the line on passing plays and allowing two sacks in a pair of games is promising. That, however, isn’t what Menet and the line take the most pride in. The transition has come with some room for growth. Defenders have had their success against the offensive line, recording 11 tackles for loss that cost the Lions 42 yards. Defenses also rushed McSorley — whom the Lions are thankful can move around enough on his own — six times. The toughest part for Menet is having to be responsible for the ball and then helping keep a play alive. Menet looks to keep improving on his game going up against the Golden Flash defense.